Accelerate and sustain business success through ADI’s science-based approach to leadership and coaching. Organizational success starts with leadership, yet not all leaders are equipped to earn the very best from others. The solution is a systematic approach for developing leaders and creating work environments that motivate and sustain a high-performing and engaged workforce. No one helps you do this better than ADI. I stand behind the impact ADI can have on any organization. For me and for my team at iD Tech, (Behavioral Leadership) has been a game changer. Here are just a few ways ADI supports you in applying sound behavioral principles to motivate and sustain business performance. Develop leaders’ skill in improving performance through a common scientific framework and coaching process. Build a strong and positive, high-performing culture that maximizes the discretionary effort of your workforce. Create a workplace that promotes discretionary effort, collaboration, and enthusiasm at all levels of the organization. Define your desired business results and the critical few behaviors required at each level of your organization to achieve those results. Equip leaders and managers with the people management skills needed to positively engage and influence others. Identify and reinforce key sales behaviors that consistently produce and accelerate results. Accelerate the personal growth of your executives through direct, honest, and helpful feedback that aligns their actions and decision-making with the impact they desire. Gain actionable insight into the strengths and opportunities of your current leadership, organizational systems, and culture. M&T Bank moved away from a focus on the performance appraisal process and instead built a system for managing people performance using ADI’s behavioral approach. 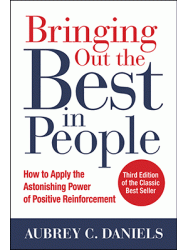 If you are looking for ways to maximize employee performance and earn discretionary effort, look no further than the behavioral tools and principles discussed in this book. Author, Aubrey Daniels delivers step-by-step instruction and positive practices that any reader can apply. Ready to motivate and sustain business success? Complete the form or call us to get started!